The region of Flanders, near the border with France, is famous for both its history and its beer. Many tourists, especially from the Commonwealth, visit here because it is the sight of many World War I battlefields and graveyards. It is also where the inspiration for the poem “In Flanders Fields” comes from. 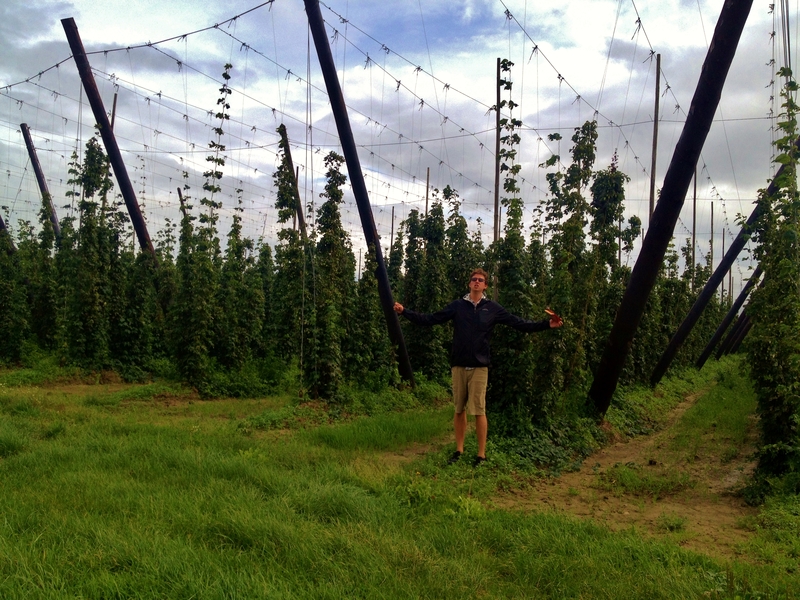 Additionally, due to the fertile countryside, it is also one of the premier hop-growing areas of the world, and is the home of the best breweries in Belgium (and the world, in my opinion). 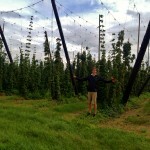 We decided to make this part of the country a two day trip so we could fully enjoy the beer on the first day, and the history on the second. First, a bit of background. 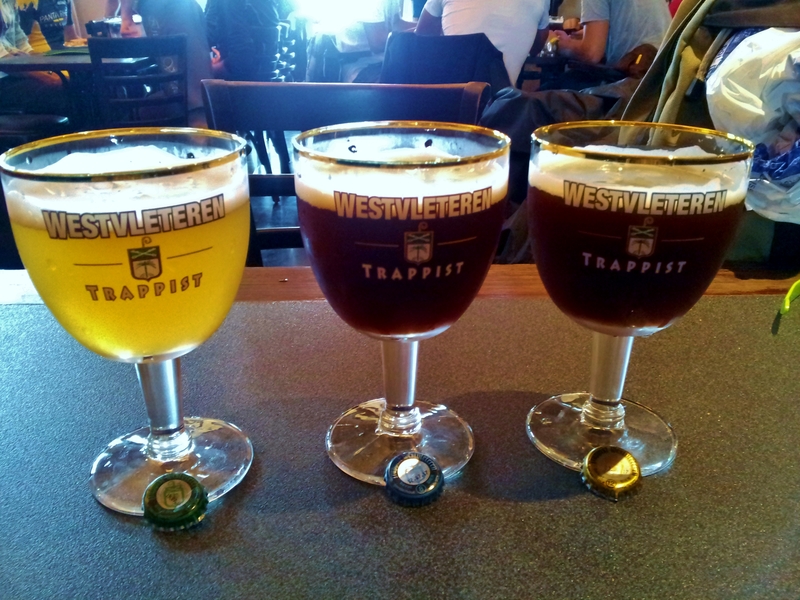 Westvleteren 12 is considered by many to be the “Best Beer in the World”. Part of this is because it tastes really really good, but another aspect is because it is so exclusive. The Saint Sixtus Abbey in Westvleteren is the only brewery that makes it, and they only (officially) sell it either from the brewery or from their café across the street. Because there is such low production and high demand, you have to make a reservation with the brewery months in advance to pick up your beer, or try your luck at the café. Even if you do get a reservation, you are only allowed one case every 60 days! As such, there is a kind of black market for the beer – no one has it out for sale, so you have to ask in a discreet way. Even then, those who had it for sale were selling it for over 15€ a bottle! We were also told there is a lot of counterfeiting – people will buy fake bottles and caps from China, fill it them with an inferior brown beer, bottle them, and sell them with the same high markup. As far as we’ve heard, they’ve only been on sale in the US once; in 2012, when they were going for $80 for 4, and that was to fund some renovations to their abbey. So it’s the “golden goose” of beers. We read online from several sources that you could bike out to the café, so we took an early train to the nearest “major” city, Poperinge, and rented bikes for 10€/day from the Belfort Hotel. There is a tourist information center off the main square in town which sells bike maps for 6€. They have done a good job at marking the back farm roads with numbers to make biking a bit easier (probably because of all the drunk bikers getting lost). We, of course, thought it was silly to rent bikes just to go to one brewery, so we did some research and discovered two other nearby breweries which happened to be on our list: St. Bernardus (#4) and De Struise (#3 and #5), in addition to Westvleteren (#1 and #6). With a lot of ambition, we set out on the 20+ mile bike-ride. 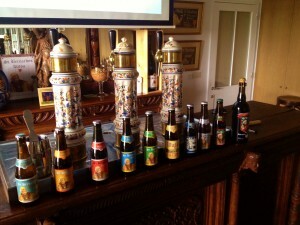 The tour at St. Bernardus is definitely worthwhile. Our first and only reservation was at St. Bernardus at 12 PM, which we hustled out to the brewery, which turned out to be a rather grueling 45 minute ride. We didn’t have time to eat in town, so we just grabbed some food from a grocery store and peddled out. We arrived at 12:03 to only to discover the door was locked and no one was home. Luckily after a few minutes of banging on the door, a nice lady found us and took us to the tasting room. We were supposed to have a tour group of ~25, but only two others were there, so we had some time to wait and scarf down some sandwiches. The rest of the tour didn’t show up, so we started our tour with just the four of us. Eventually the other groups showed up, but since we had already done half the tour she let us go to the tasting room early, and we got a bonus St. Bernardus 12! Score! The brewery was really worthwhile, as they explained how they (the #4 beer) actually were the brewery for Westvleteren (the #1 beer) until 1992, when the abbey decided to bring the brewery in-house. St. Bernardus kept the original yeast strain, so it is still very close to the Westy (and we think it tastes a bit better). They also gave you a full gift set with four beers and a glass for doing the tour, which was a nice bonus. 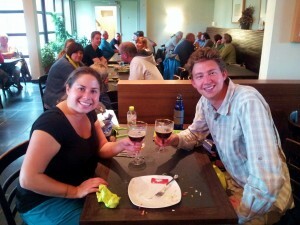 We strapped them to our bikes, and with a nice buzz, moved on to Café de Verde to try the best beer in the world. Another 45 minute bike ride later, we were starting to feel the pain in our thighs and the beer in our heads. We grabbed our St. Bernardus gift packs and went inside the café, which was packed with people (I guess word has gotten out about this place…). We noticed everyone was looking at us, but we thought we just looked sweaty, and people were appalled we were bringing in another brewery’s beer. Not to be deterred, we grabbed a seat and ordered one each of their blonde, the Westy 8 (#6) and the allusive Westy 12 (#1!). It was a big moment in our beer drinking tenure, and we finally tried the number one beer in the world! It was very, very good, and we ordered another one just for posterity, in case we never came across it again. We are glad we did, because the café had been sold out of the beer for several days, and didn’t have any available for takeaway until the following week. While a bit bummed that this might be our only opportunity to taste it, we went outside to take pictures, and were noticing we still got the same weird looks. Finally, someone came up to us and asked, “where did you get those gift packs?!”. We realized quickly that people thought we had found a secret stash of Westy gift packs and they wanted in on it. Once we burst their bubble, we became a lot less popular. At this point we were pretty buzzed from several 12% beers, but we forged ahead to our final brewery, De Struise. De Struise is almost the exact opposite of St. Bernardus and Westy – they are a local craft brewer that makes a lot of interesting flavors, and conditions their beer in wine casks. They have a nice outdoor BBQ area where you can chill out and try samples of all their beer. We tried the #3 beer, the Pannepot, and really liked it, although they didn’t have the #5, the Pannepot Reserva, in stock. Bummed we might miss out, we asked the staff and they told us a restaurant across the street might have some in their cellar. 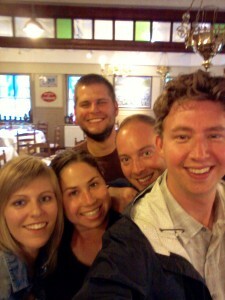 While we waited until we were hungry, we made friends with some Belgians from Antwerp. They seemed pretty impressed by our goal of trying such good beers. We all ended up going to the restaurant together, and sure enough, they had the Reserva in stock! The beer was actually from 2009, and while we were a bit skeptical about how good a 5 year old beer would be, it was more delicious than this year’s batch. Apparently because of the cask conditioning, it ages much better. We ended the day with a final 45 minute bike ride to our Bed and Breakfast, which was good because our livers and legs needed a break. 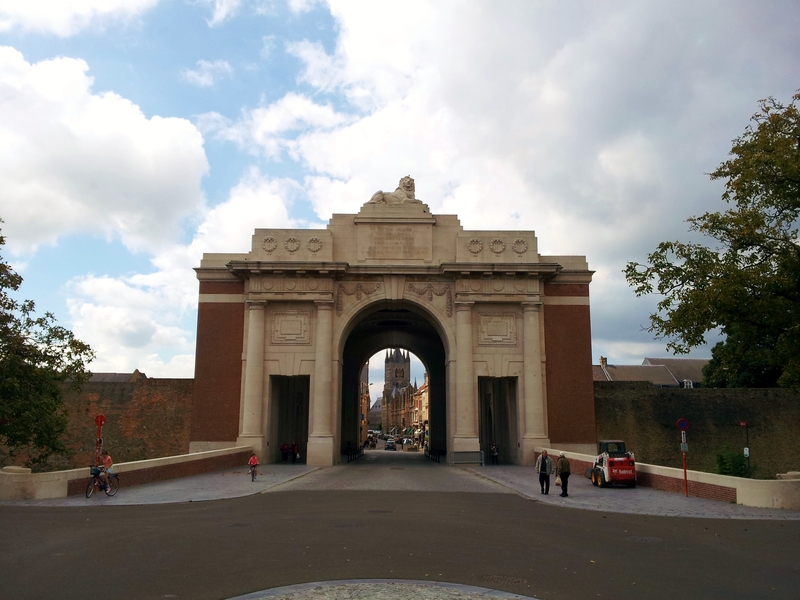 We woke up the next morning, and after a filling and delicious breakfast, took our backpacks on our bikes and went into nearby Ypres. The luggage storage lockers were broken so we had to schlep through town with our bags (now including two beer gift packs) and sore legs. 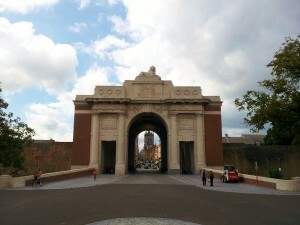 We visited the Menin Gate, which was built in honor of the victims of WWI. We went to the In Flanders Field Museum there, which was a pretty interesting collection of history and stories about WWI and the effects on the area, which were devastating. Ypres and the area had the unfortunate designation of being the spot where the French and German armies met and set up their trenches and “no-mans’ land”. At the end of the day, more than 500,000 people lost their lives in this region alone (almost 5% of WWI deaths) and this part of the country never was able to catch up to the rest of Belgium in terms of development or industry. Very tragic, but it was nice to get some historical context around the fields we were biking in the previous day. On our way out, we stumbled across a beer store recommended by De Struise, and they had some of the bottles from the previous day for sale, including another bottle of 2010 Reserva. We also picked up some pate made with hops, and delicious chocolates made with hop ganache. Yum!